The Middle School Math Teacher is responsible for teaching principles and practice of the Subject Mathematics to Middle School students. 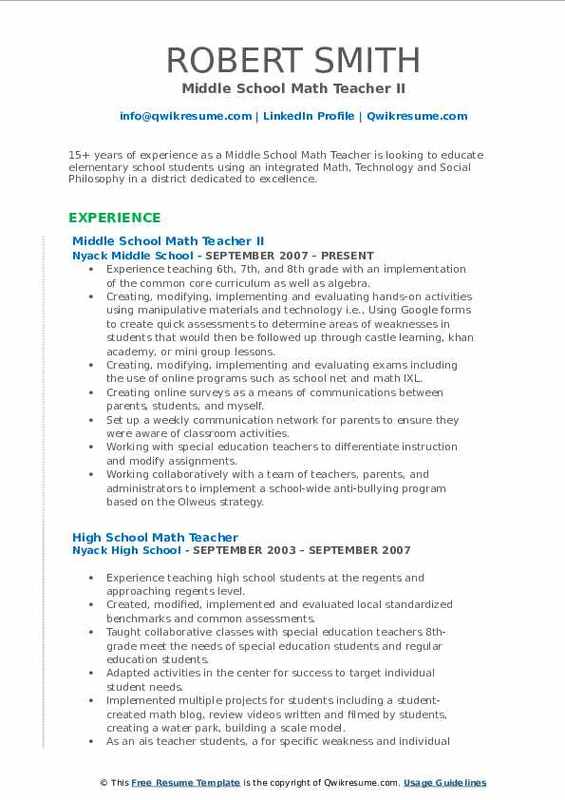 The other job tasks that are commonly seen on most of the Middle School Math Teacher Resume include the following – instructing middle school students with mathematics syllabus, creating appropriate lesson plans, assigning work assignments and home assignments, evaluating progress of the student, conducting tests and quiz, and teaching complicated mathematical formulas and concepts in an understandable manner. Middle School Math Teachers are the ones who lay a strong mathematical foundation in students and hence they are supposed to depict crucial skills and abilities such as – strong mathematical knowledge, the ability to teach and explain complicated topics in a simple way, a flair to encourage and be interactive with wards, and an ability to train students in multi-faceted fields. While most of the applicants have a College Degree with Specialization in Mathematics, it would be advantageous to have a Master’s degree along with a degree in Education. Summary : During the past 16 years as a Middle School Math Teacher, I have learned a lot about how to help students, teachers, parents, and administration make school a place for children to learn and grow. My diverse experiences make me flexible, determined, and a quick study. I will add value to your school community. Skills : Microsoft Office Suite, Google Applications, Pearson Software, Typing Average 70 Wpm, Customer Service, Data Entry, And Management. Maintain accurate, complete, and correct student records as required by law s and district policies. Assist students who need extra help, such as by tutor implementing remedial programs. Provide a balanced program to provide students with opportunities to observe, question, and investigate. Meet or correspond with parents or guardians to discuss children's progress and to determine needs. Encourage students to explore earning opportunities and to persevere with challenging tasks. Collaborate with other staff in the development, evaluation, and revision of programs. Plan and supervise class projects, field trips, visits by guest speakers or other experiential activities. Prepare for assigned classes and show written evidence of preparation upon request. 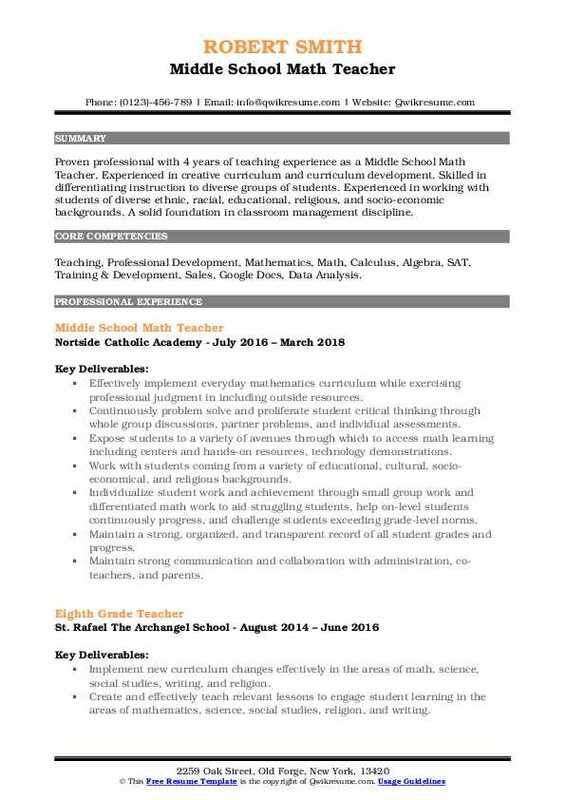 Objective : One year of experience as a Middle School Math Teacher is seeking to make a positive change in education and in the lives of students by motivating them and enhancing their classroom experiences, utilizing my teaching experience, leadership experiences, interpersonal skills, and intense passion for education and learning. Skills : MS Office, Typing Average 70 Wpm, Customer Service, Data Entry, Management, Office Management, Teaching, Windows, And IOS. Implemented the Archdiocese of San Antonio Catholic schools mathematics curriculum guide. Analyzed formative data in order to provide targeted instruction based on students individual needs. Presented students with instructional strategies that engaged, motivated and supported them in their mastery of mathematics standards. Developed and implemented lesson plans that addressed the learning styles of all students in 3 different grade levels. Prepared lessons that reflected accommodations for differences in learning styles of all middle school students. Planned and used appropriate instructional and learning strategies, activities, materials, and equipment that reflected an understanding of the learning styles and needs of the middle school students. Conducted an assessment of each students learning and used results to plan appropriate and targeted instructional activities. Worked cooperatively with other teachers to modify curricula as needed for struggling learners. Worked with campus staff to address the needs of students who were performing below grade level. Actively researched new ways to keep students engaged and motivated to learn new concepts. Worked as part of a campus problem-solving, solution-finding team that developed appropriate learning experiences and support for all students. Communicated in a timely and professional way with parents/guardians about individual students progress. Headline : 5+ years of experience as a Middle School Math Teacher. 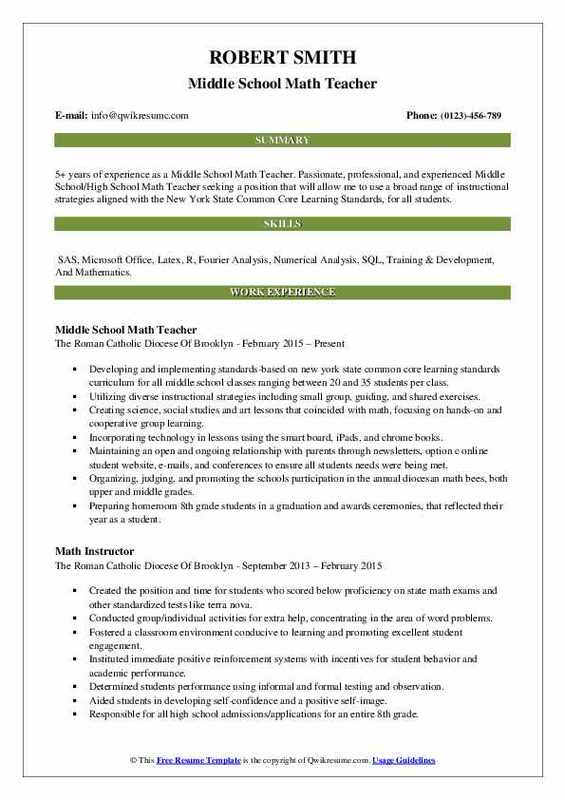 Passionate, professional, and experienced Middle School/High School Math Teacher seeking a position that will allow me to use a broad range of instructional strategies aligned with the New York State Common Core Learning Standards, for all students. Skills : SAS, Microsoft Office, Latex, R, Fourier Analysis, Numerical Analysis, SQL, Training & Development, And Mathematics. Developing and implementing standards-based on new york state common core learning standards curriculum for all middle school classes ranging between 20 and 35 students per class. Utilizing diverse instructional strategies including small group, guiding, and shared exercises. Creating science, social studies and art lessons that coincided with math, focusing on hands-on and cooperative group learning. Incorporating technology in lessons using the smart board, iPads, and chrome books. Maintaining an open and ongoing relationship with parents through newsletters, option c online student website, e-mails, and conferences to ensure all students needs were being met. Organizing, judging, and promoting the school's participation in the annual diocesan math bees, both upper and middle grades. Preparing homeroom 8th grade students in a graduation and awards ceremonies, that reflected their year as a student. Establishing a structured classroom environment that provided students with the freedom of self-directed exploration. 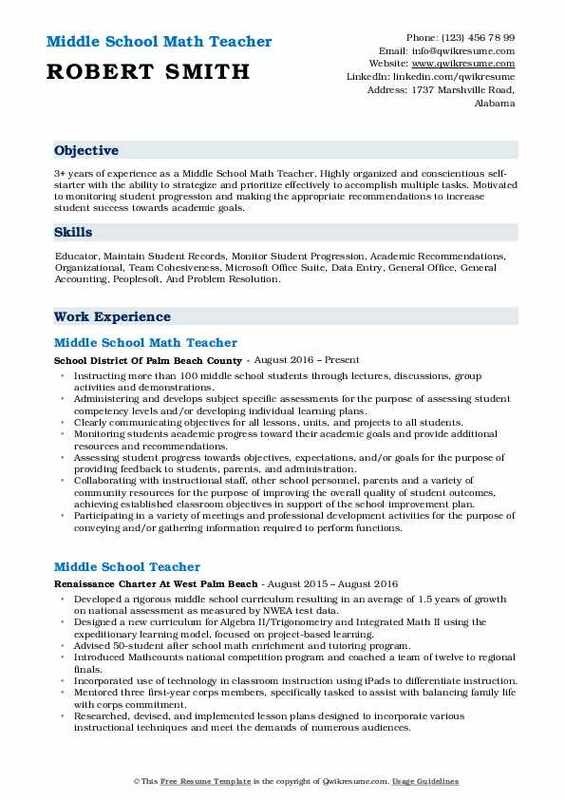 Summary : 15+ years of experience as a Middle School Math Teacher is looking to educate elementary school students using an integrated Math, Technology and Social Philosophy in a district dedicated to excellence. 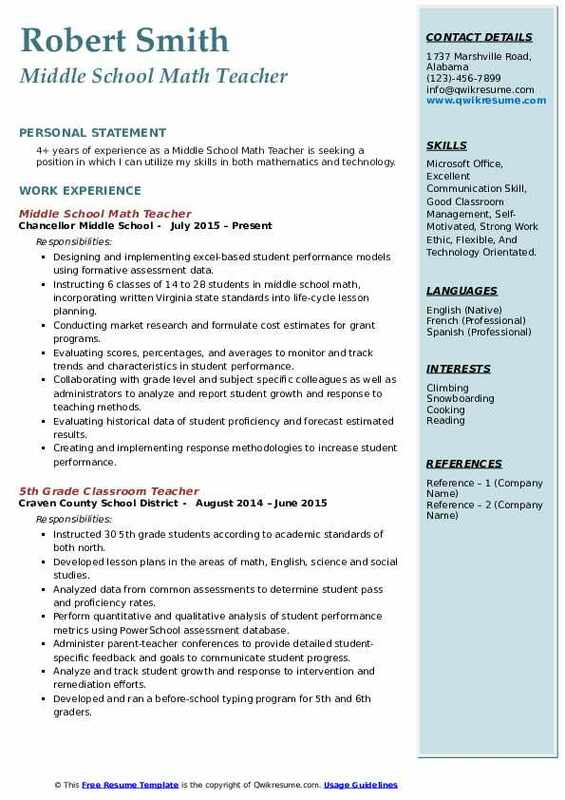 Skills : Coaching, Homeschool Co-op Teacher, Math, Calculus, Algebra, SAT, Good Classroom Management, Self- Motivated, Strong Work Ethic, Flexible, And Technology Orientated. Experience teaching 6th, 7th, and 8th grade with an implementation of the common core curriculum as well as algebra. Creating, modifying, implementing and evaluating hands-on activities using manipulative materials and technology i.e., Using Google forms to create quick assessments to determine areas of weaknesses in students that would then be followed up through castle learning, khan academy, or mini group lessons. Creating, modifying, implementing and evaluating exams including the use of online programs such as school net and math IXL. Creating online surveys as a means of communications between parents, students, and myself. Set up a weekly communication network for parents to ensure they were aware of classroom activities. Working with special education teachers to differentiate instruction and modify assignments. Working collaboratively with a team of teachers, parents, and administrators to implement a school-wide anti-bullying program based on the Olweus strategy. Collaboration with 7th and 8th-grade teachers to create quarterly exams as well as midterm and final exams. 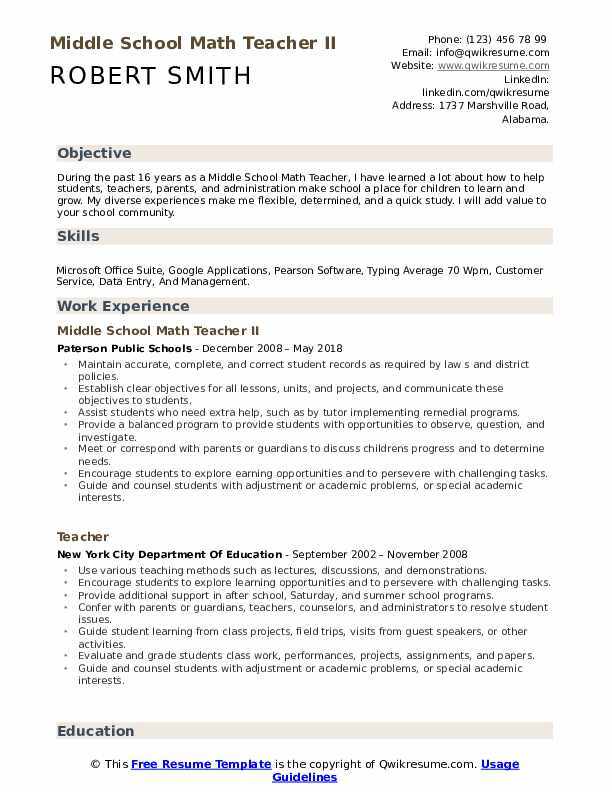 Objective : 4+ years of experience as a Middle School Math Teacher is seeking a position in which I can utilize my skills in both mathematics and technology. 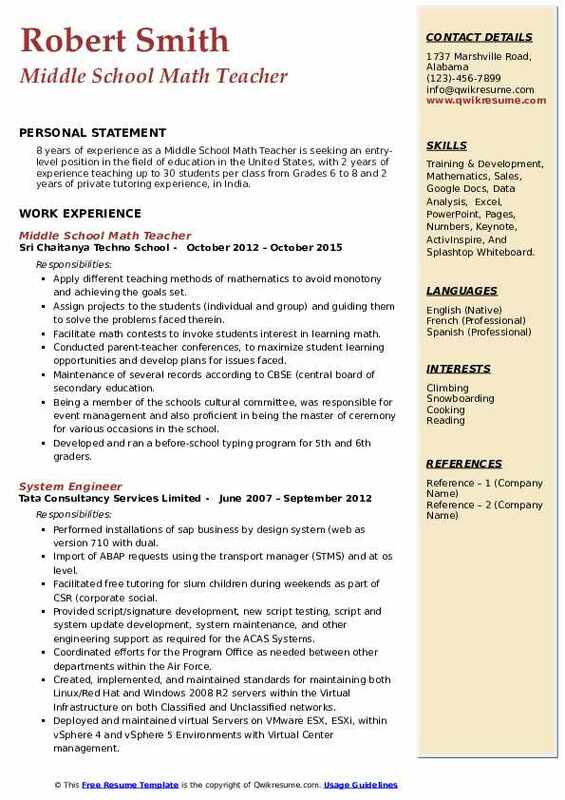 Skills : Microsoft Office, Excellent Communication Skill, Good Classroom Management, Self- Motivated, Strong Work Ethic, Flexible, And Technology Orientated. Designing and implementing excel-based student performance models using formative assessment data. Instructing 6 classes of 14 to 28 students in middle school math, incorporating written Virginia state standards into life-cycle lesson planning. Conducting market research and formulate cost estimates for grant programs. Evaluating scores, percentages, and averages to monitor and track trends and characteristics in student performance. Collaborating with grade level and subject specific colleagues as well as administrators to analyze and report student growth and response to teaching methods. Evaluating historical data of student proficiency and forecast estimated results. Creating and implementing response methodologies to increase student performance. Organizing student and classroom data on excel spreadsheets according to mathematics standards and student/classroom needs, which led to an average of 150% increase in student proficiency from the previous year on common assessments. 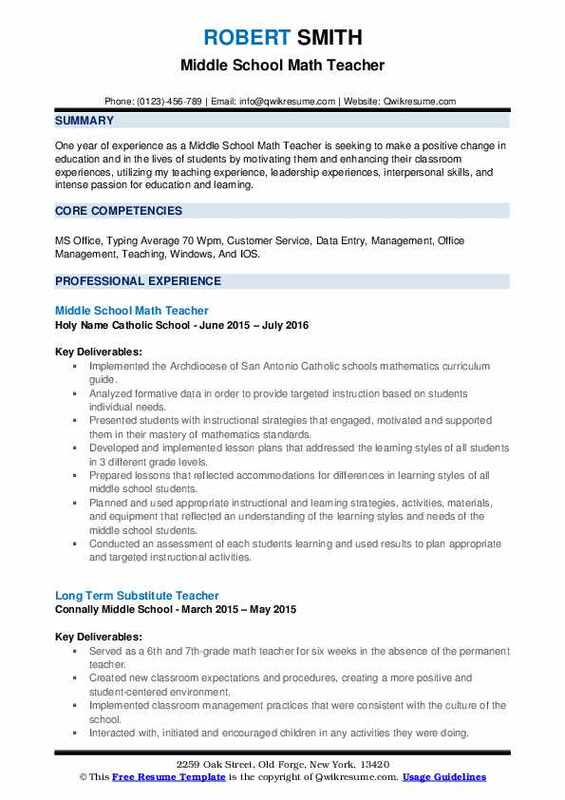 Objective : 3+ years of experience as a Middle School Math Teacher. Highly organized and conscientious self-starter with the ability to strategize and prioritize effectively to accomplish multiple tasks. Motivated to monitoring student progression and making the appropriate recommendations to increase student success towards academic goals. Skills : Educator, Maintain Student Records, Monitor Student Progression, Academic Recommendations, Organizational, Team Cohesiveness, Microsoft Office Suite, Data Entry, General Office, General Accounting, Peoplesoft, And Problem Resolution. Instructing more than 100 middle school students through lectures, discussions, group activities and demonstrations. Administering and develops subject specific assessments for the purpose of assessing student competency levels and/or developing individual learning plans. Clearly communicating objectives for all lessons, units, and projects to all students. Monitoring students academic progress toward their academic goals and provide additional resources and recommendations. Assessing student progress towards objectives, expectations, and/or goals for the purpose of providing feedback to students, parents, and administration. Collaborating with instructional staff, other school personnel, parents and a variety of community resources for the purpose of improving the overall quality of student outcomes, achieving established classroom objectives in support of the school improvement plan. Participating in a variety of meetings and professional development activities for the purpose of conveying and/or gathering information required to perform functions. Establishing positive rapport with all students and parents through home calls and emails. Consistently receiving positive teacher evaluations from administration and district personnel. Provided one-on-one attention to students, while maintaining the overall focus on the entire group. Summary : 13+ years of experience as a Middle School Math Teacher. An Enthusiastic and motivated middle school math teacher committed to creating a productive, challenging, yet encouraging atmosphere that is conducive to a proficient learning of basic math concepts with a special emphasis on active classroom participation. Very approachable and personable tutoring skills with a keen eye for details capable of deciphering unique sets of challenges and planning lessons accordingly. Skills : Excellent Communication Skill, Good Classroom Management, Self- Motivated, Strong Work Ethic, Flexible, Technology Orientated, Differentiated Instruction, And Strong Interpersonal. Recording student grades and track progress throughout the school year. Implementing various strategies and techniques to enhance student learning. Developing and modifying lesson plans to enhance student knowledge and performance. Applying the use of technology in the classroom to increase student participation, interaction, and practice. Working with co-teacher to increase content knowledge of all students in the classroom. Teaching in the afterschool program and Saturday school to assist underperforming students. Teaching eighth-grade math during summer school to help prepare those students for high school. Meeting and planning with other math teachers to use student data to drive instruction. 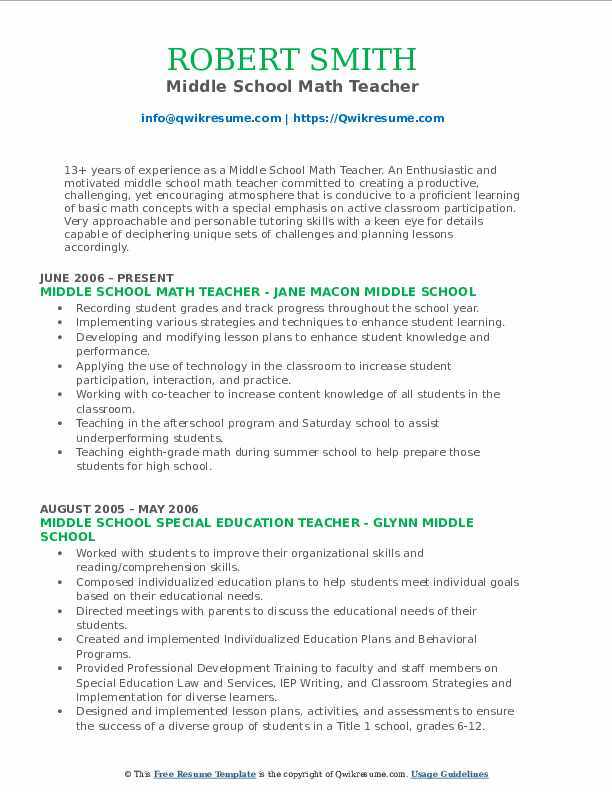 Objective : Proven professional with 4 years of teaching experience as a Middle School Math Teacher. Experienced in creative curriculum and curriculum development. Skilled in differentiating instruction to diverse groups of students. Experienced in working with students of diverse ethnic, racial, educational, religious, and socio-economic backgrounds. A solid foundation in classroom management discipline. Skills : Teaching, Professional Development, Mathematics, Math, Calculus, Algebra, SAT, Training & Development, Sales, Google Docs, Data Analysis. Effectively implement everyday mathematics curriculum while exercising professional judgment in including outside resources. Continuously problem solve and proliferate student critical thinking through whole group discussions, partner problems, and individual assessments. Expose students to a variety of avenues through which to access math learning including centers and hands-on resources, technology demonstrations. Work with students coming from a variety of educational, cultural, socio-economical, and religious backgrounds. Individualize student work and achievement through small group work and differentiated math work to aid struggling students, help on-level students continuously progress, and challenge students exceeding grade-level norms. Maintain a strong, organized, and transparent record of all student grades and progress. Maintain strong communication and collaboration with administration, co-teachers, and parents. 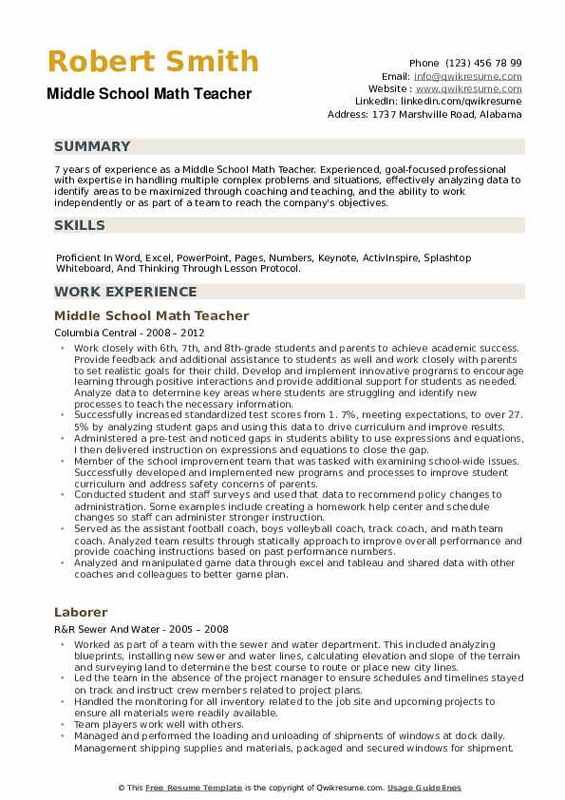 Summary : 8 years of experience as a Middle School Math Teacher is seeking an entry-level position in the field of education in the United States, with 2 years of experience teaching up to 30 students per class from Grades 6 to 8 and 2 years of private tutoring experience, in India. Skills : Training & Development, Mathematics, Sales, Google Docs, Data Analysis, Excel, PowerPoint, Pages, Numbers, Keynote, ActivInspire, And Splashtop Whiteboard. Apply different teaching methods of mathematics to avoid monotony and achieving the goals set. Assign projects to the students (individual and group) and guiding them to solve the problems faced therein. Facilitate math contests to invoke students interest in learning math. Conducted parent-teacher conferences, to maximize student learning opportunities and develop plans for issues faced. Maintenance of several records according to CBSE (central board of secondary education. Being a member of the school's cultural committee, was responsible for event management and also proficient in being the master of ceremony for various occasions in the school. Developed and ran a before-school typing program for 5th and 6th graders. Differentiated instruction to meet the needs of diverse learners; worked with small groups or individuals daily, especially with regards to mathematics. Summary : 7 years of experience as a Middle School Math Teacher. Experienced, goal-focused professional with expertise in handling multiple complex problems and situations, effectively analyzing data to identify areas to be maximized through coaching and teaching, and the ability to work independently or as part of a team to reach the company's objectives. Skills : Proficient In Word, Excel, PowerPoint, Pages, Numbers, Keynote, ActivInspire, Splashtop Whiteboard, And Thinking Through Lesson Protocol. Work closely with 6th, 7th, and 8th-grade students and parents to achieve academic success. Provide feedback and additional assistance to students as well and work closely with parents to set realistic goals for their child. Develop and implement innovative programs to encourage learning through positive interactions and provide additional support for students as needed. Analyze data to determine key areas where students are struggling and identify new processes to teach the necessary information. Successfully increased standardized test scores from 1. 7%, meeting expectations, to over 27. 5% by analyzing student gaps and using this data to drive curriculum and improve results. Administered a pre-test and noticed gaps in students ability to use expressions and equations, I then delivered instruction on expressions and equations to close the gap. Member of the school improvement team that was tasked with examining school-wide issues. Successfully developed and implemented new programs and processes to improve student curriculum and address safety concerns of parents. Conducted student and staff surveys and used that data to recommend policy changes to administration. Some examples include creating a homework help center and schedule changes so staff can administer stronger instruction. Served as the assistant football coach, boys volleyball coach, track coach, and math team coach. Analyzed team results through statically approach to improve overall performance and provide coaching instructions based on past performance numbers. Analyzed and manipulated game data through excel and tableau and shared data with other coaches and colleagues to better game plan.